I found myself agreeing with just about everything Peggy Drexler, Forbes Contributor, says in her article about women, competence and confidence. Female employees now make up half the workforce, and the impact they’re having on that workforce is significant. Women at work are more capable than ever before. Women need more than competence to succeed long term...they need confidence! Women start out wanting the top job but by mid-career their confidence starts to decrease, they begin to think they are not equipped with th right skills, they can't do the job, others are better prepared and suited. Ultimately, women do not help themselves as well as not being helped by inherent biases, gender pay gap and other structural reasons. According to Peggy, studies have demonstrated that self-doubt is often the product of girls' upbringing, what they are praised for, the qualities that are mostly valued in girls, such as being quiet, modest, meek...if it sounds old-fashion to you, well it absolutely is, but still it's very true. It is also what Cheryl Sandberg of Facebook refers to when she says that little girls may be called 'bossy' whereas little boys are praised for their leadership qualities. The impact of this can be huge later on and particularly in work related circumstances, where being meek, modest and quiet takes you absolutely nowhere. Bain & Company's study also shows that the traits people identify as most likely to bring promotion and success in work are the ones normally displayed by men, for example boasting about your successes, developing and using strong networks effectively and putting in really long hours. These traits are quite opposed to the one generally present in women, such as nurturing younger colleagues, praising colleagues and being open about family needs. The report goes on to say that in this context front line managers are really important to women as they become their first touch point, their windows to senior management. However, it seems to me that front line managers can only help to some extent. Because here what we are talking about is a conflict between what is being written and preached about by management gurus around collaborative organisations and authentic leadership, and what companies actually do and practice internally and their organisational culture. 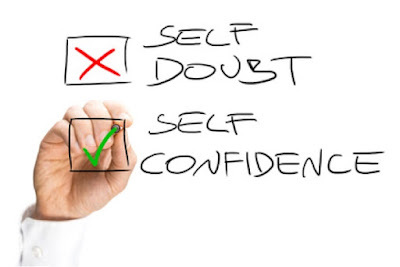 Women's self doubt is perpetuated by the fact that the professional working environment still praises to a great extent 'passe' qualities and practices. Even the most enlightened front line manager can only have so much impact on that! It is important that women acquire skills that matter in the workplace if they lack them, be it networking or critical thinking. But it is also critical that women build their strength and confidence on the understanding that their competence, jointly with their leadership traits will be not only useful but actually sought after by their companies. If that does not happen women will try and fail and doubt themselves even more. But in my view, unless there are enough women at the top available to listen and capable of influencing, that will not be possible. So we are back to square one, to the need of role models, mentors, sponsors, men who won't just recruit on a same- same basis and women who will open up the flood gate for other women. Somehow I cannot see it happening just like that, as I have been talking about the topic for almost 15 years and relevant management literature is older than that. So that is why the idea of introducing quotas should not be totally discarded. But what do you think? Please email me your thought or leave a comment below, thank you!